Every single thing I know about hummingbird identification — and a measurable share of what I know about hummingbirds, period — I owe to Steve Howell’s photographic guide. A feeder, a scope or pair of binoculars, and that book open on the table in front of you for a couple of hours, and suddenly things once inscrutable begin to make sense. Frustration cedes to challenge and, yes, even to fun. Click on the photo to see the entire wing. One of the neatest tricks in the book is the identification of birds in the genus Archilochus using the relative widths of the primaries. 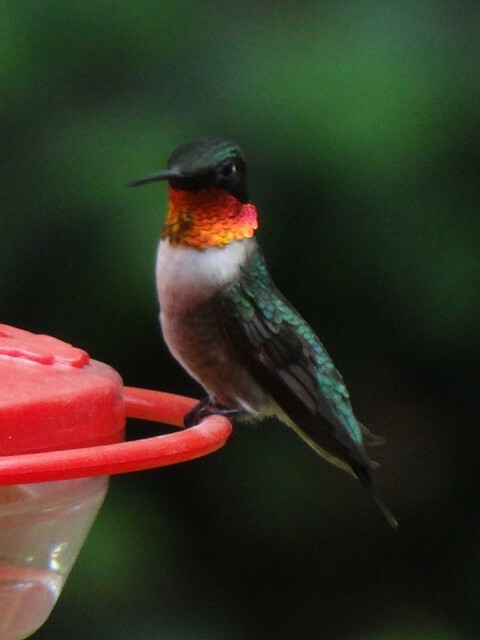 On most hummingbirds, the primaries are of more or less even breadth (except, obviously, where the outermost is modified to produce sound, as in Selasphorus). 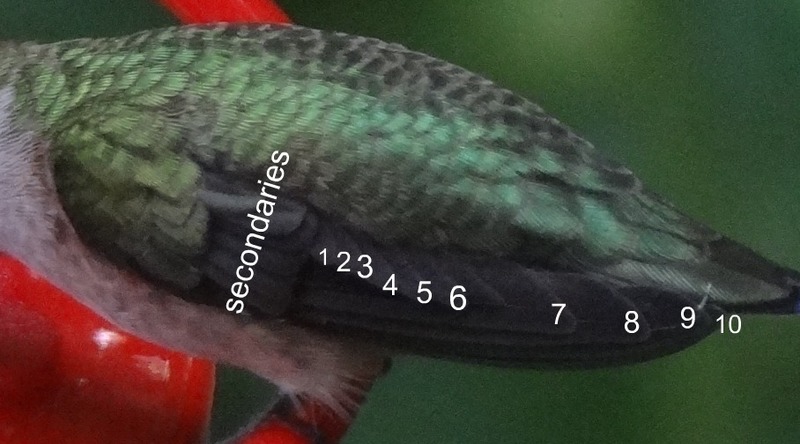 In Archilochus, though, the outer four — numbered by convention 10 through 7 — are significantly and visibly wider than the inner six (6 through 1), as even my smudgy photo of a ruby-throated hummingbird reveals. In the field or at the feeder, the result is a row of “mini-feathers” along the top of the folded primaries, ending at the square secondary panel. As to distinguishing between the two species of Archilochus, I’ll admit that I don’t always find it as easy as other people apparently do. Me, I see plenty of female-plumaged individuals whose outermost primary (10) strikes my eye as neither especially broad and blobby-tipped (as in the black-chinned) nor particularly narrow and sharp-ended (as in the ruby-throated). To be honest and lazy, I don’t worry about it that much this time of year in my New Jersey backyard. the shape of their wings is quite notable…. The outermost four or five feathers are very long, the next much less so, and those nearest the body are exceedingly short, all of which, combined with the fact that the large outer primaries are recurved, makes the spread wings look like a stretched bow; the body of the little bird is in the center like the arrow. Subsequent writers seemed to ignore what the great Frenchman had found “assez remarquable.” Audebert and Vieillot, and later on Lesson, ignore this feature. MacGillivray’s dissections say nothing of it. Bourcier and Mulsant, naming the black-chinned hummingbird in 1846, offer no detail beyond calling the bird’s wing “falciform.” And Reichenbach, when he created the oddly named genus eight years later, provided no diagnosis at all. a comment illustrated with a sketch by the youngest author. inner six [primaries are] abruptly smaller and more linear. six innermost (proximal) primaries abruptly, and in adult males conspicuously, smaller than the rest. This was not, however, one of the in-hand characters that passed from the museum into the field in the 1920s and 1930s. No doubt deemed too fine, too subtle, and just too downright small for the optics of the day, the wing structures of hummingbirds went unmentioned in the popular guides — and I have the impression, too, from some quick sniffing around in the more technical manuals, that primary shapes were gradually neglected even there. One of the great projects of the past 30 years — starting with “the new approach” and continuing with such fine books as Howell’s photograph guide — has been to return to the drawers and the handbooks in search of neglected, forgotten, and misunderstood information that we can use in the field. The wing shape of Archilochus hummingbirds is just one of the best-known examples — why not go out and come up with more? A few respondents went on to identify the bird to species — and a majority decided (incorrectly) that this was a black-chinned. I repeat: Not as easy as often claimed! A n o t h e r Hummingbird Quiz? Some of us were talking about hummingbird wing structures the other day — which may be why some of us don’t get invited to many cocktail parties. In any event, take a look at this. What genus does this bird belong to? Two hummingbirds, photographed north of Mexico. What are they? With hummingbirds as with all birds, start, when you can, at the rear, with the length and shape of the tail and the wingtip. The lefthand bird — the one with its head pattern so conveniently blotted out — shows a long tail that extends beyond the wingtip, which is itself long and noticeably pointed. The bunched secondaries are more or less uniformly wide. All of that rules out many possibilities. If we look closely at the pattern of that long tail, we see a definite rufous edge to the outermost rectrix; the upper tail coverts and rump are the same emerald green as the back. 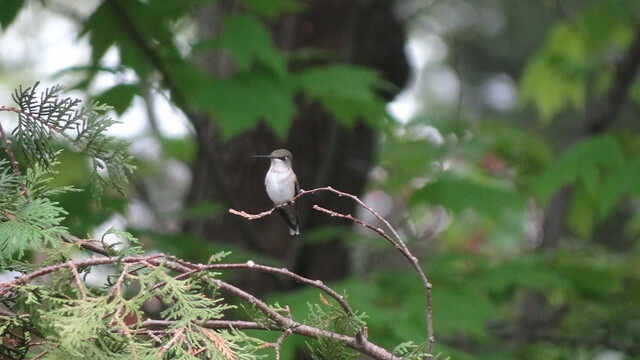 Put it together, and we can identify this bird easily as a broad-tailed hummingbird. The second bird, most of it invisible behind its saccharine lunch, seems to be larger, an impression created mostly, I think, by its relatively upright posture: the bigger the hummingbird, the more vertical its perch on a feeder. 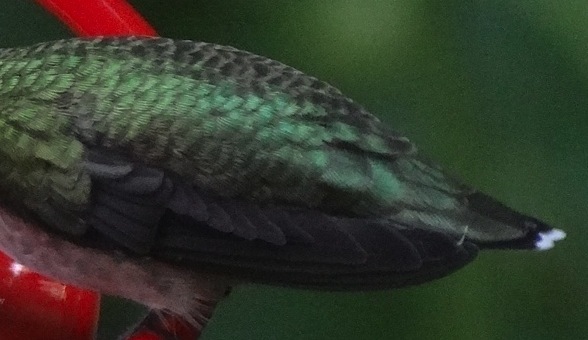 The dirty white underparts with coarse, dingy gray-green spangles should lead us to the correct identification: this one’s an Anna’s hummingbird. Fun stuff. 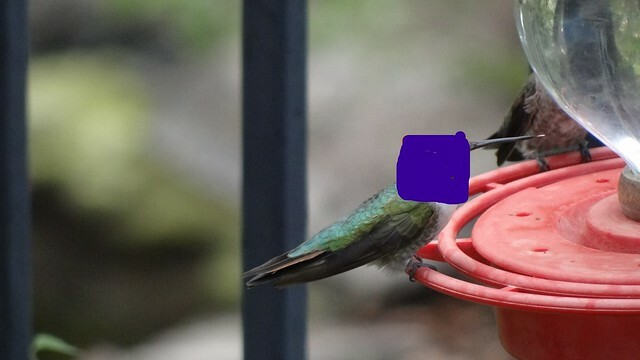 And a timely reminder to those of us in the east to start checking feeders for “other” hummingbirds, even as ruby-throated numbers remain high for the next month. Two birds, both photographed north of Mexico.